Custom exterior signage helps you to tell your story loud and clear. 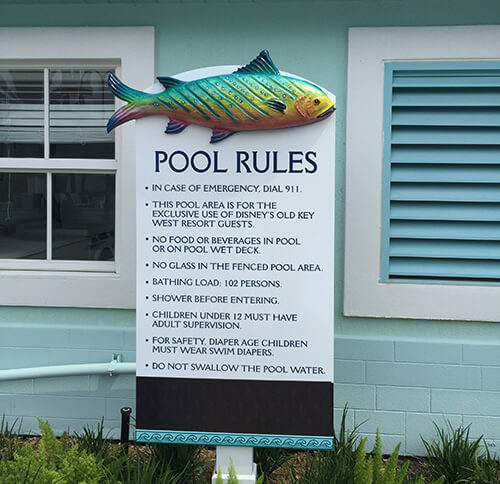 From window signs and plaques to poolside signs and other types of outdoor signs, you need to get extraordinary signs that tell a vivid story and create the maximum impact for your brand among-st people. While the story matters to a great extent, the small details that help narrate that story too should be given adequate importance. From the size and colors used in images and fonts of your exterior signage to the placement of these signs, the lighting etc., every small detail needs to be planned ahead and executed well to help your brand connect with your customers and impress them with the story that has your brand message at its core. 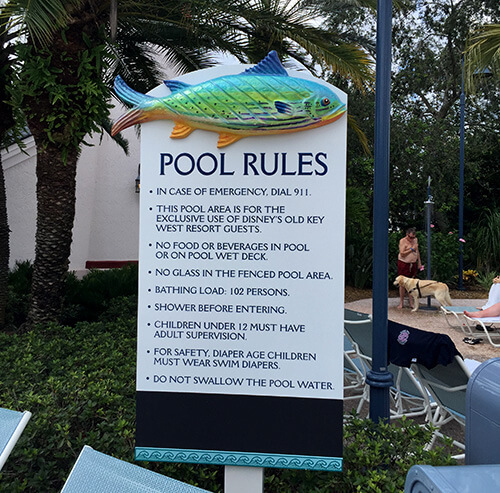 We know telling a story well is important and we were happy to help Disney do exactly the same by giving its weather-beaten pool rule signage and the artistic fishes on the signage a new lease of life. Guests visiting Disney’s Old Key West resort are transported far away from daily humdrum right away into a serene tropical paradise. Just like its rooms and sprawling grounds that tell a story, its four pools amid sparkling waterways, swaying palms, and elaborate Victorian architecture too have a lot to showcase and tell. 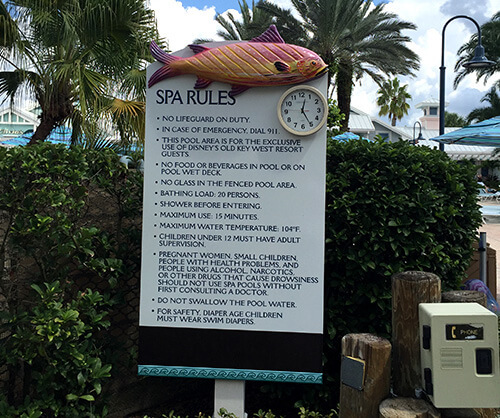 With their pools’ exterior signage that’s accompanied by somewhat fanciful, Key West-inspired, creative fishes, they wanted their patrons to know the story. Yet, the tired looking, weather-beaten fishes appeared as if the Florida sun had eroded their charm and interfered with the story that Disney wanted to tell their patrons. 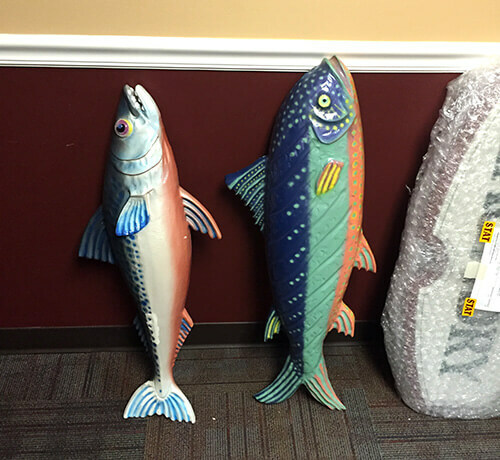 Citrus Sign Studio was brought in to give these fishes a bright and sprightly look that would help spread the message in a vibrant manner and bring cheer to the guests. Be it Key West’s historic Seaport, the delicious taste of fresh seafood (that’s just caught) and other made-to-order fish specialties, Old Key West’s authentic flavors have always had a special place for fishes. 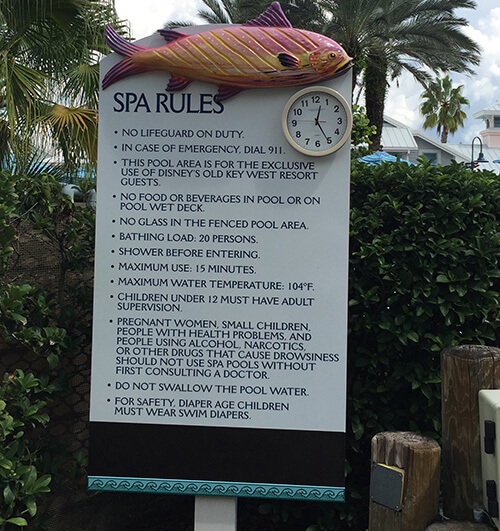 Our aim was to restore the whimsical fishes on Disney’s pool signs to their original glory, to bring back the old world charm and that unmistakable warm feeling, which a vacation in a tropical paradise brings to the resort’s patrons. We carefully studied every attention to detail that’s an important ingredient in Disney’s Key West story that they want their guests to know. 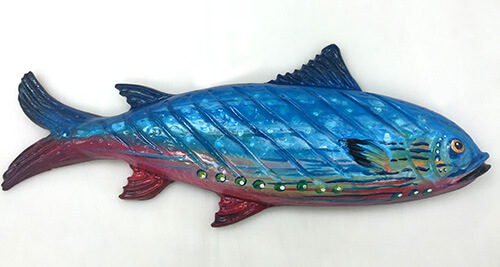 Next, our artists and designers worked on each of the 12 fishes with the right mix of colors to delicately hand-paint and restore them to their earlier, sprightly and welcoming sights. Despite the challenge involved in the task, we knew we had the right artist talent to bring the fishes back to life and we did it successfully to the complete satisfaction of Disney. For designing or restoring creative or even whimsical exterior signage that tells a vivid story, your search ends at Citrus Sign Studio.